One of the best things about working as an artist is the opportunity to donate artwork to causes that touch my heart. 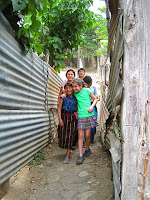 The cause that touches mine the most is our work with From Houses to Homes, in Antigua, Guatemala. FHTH was founded by a man who inspires me to no end, Joe Collins, who is currently back in the United States undergoing treatment for stage 4 colon cancer. We are all praying for him. 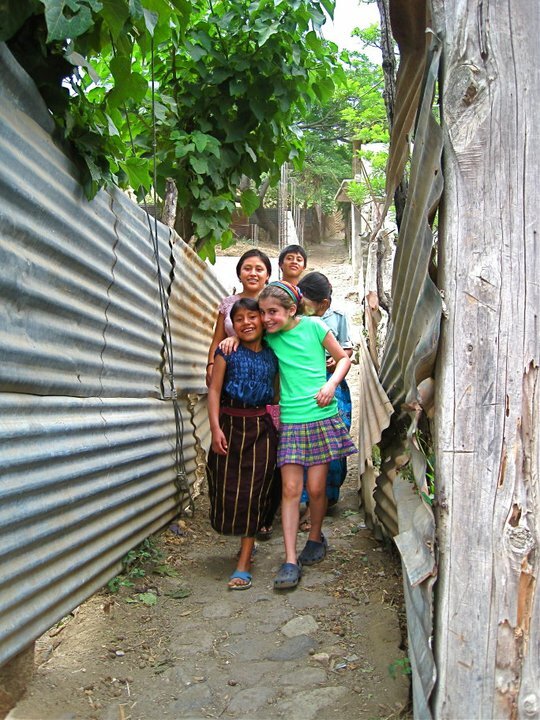 This small, non profit organization has built homes for over 500 indigenous families living in poverty in the Guatemalan highlands, a medical clinic to serve all of those families, and two schools to educate the children. 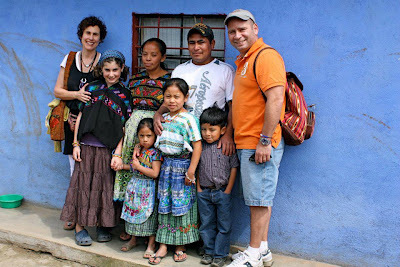 Over the past 3 years, since our first of 6 trips, we have become intimately connected with the two families whose homes we helped build, volunteered at the schools, and became godparents to the son of one of the workers. 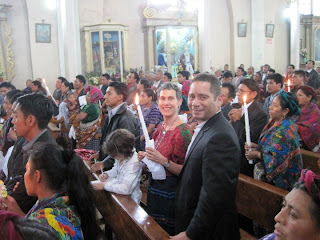 (Notice Señora Gringa in the church!). 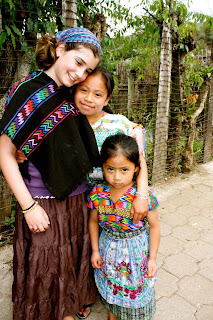 If you have a few moments, here's a video that Samy and I made for her school, which became the sister school to one of the schools in Guatemala! 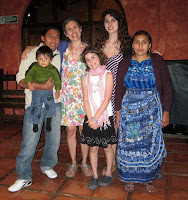 It will give you a sense of just how much we were transformed and eager to share our experience. Samy and I also wrote a book so she could convey her experience to other kids her age. 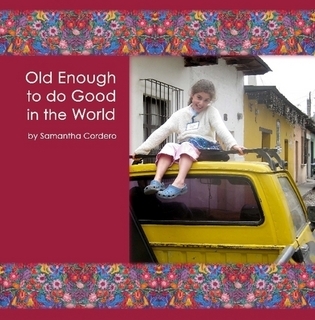 It's called "Old Enough to Do Good in the World," and would make a great holiday gift (hint hint)! 100% of the proceeds go straight to From Houses to Homes. Linking to Artists in Blogland's Fall Fearless & Fly, Paint Party Friday, Creative Every Day, and The Artful Maven's Holiday Blog Hop. Jessica.. you are such an inspiration to so many of us. Not only in your art, but in your giving and teachings. I hope and pray that Joe gets through his cancer and heals. This holiday card is fantastic! You make a difference. What beautiful photos and what a absolutely beautiful organization he has created!! Thank you for sharing!!! Thanks Julie! Love the fact that your daughter collected over 1000 bottles and cans. Awesome! I am so moved by this. Thank you for all that you have done, and for sharing your beautiful story. 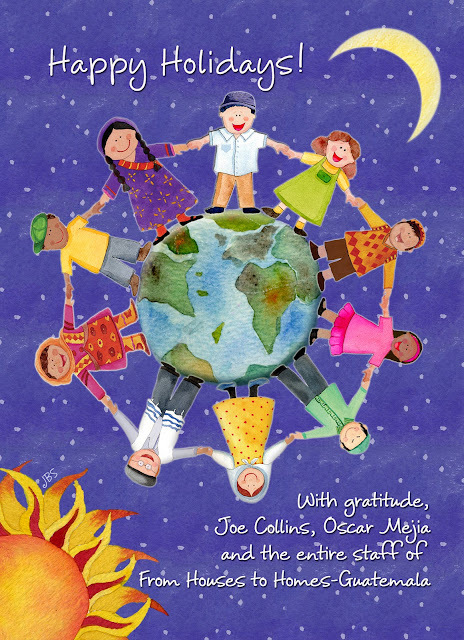 I have just ordered your daughter's book and will give it to my little girl when she is old enough to read. I dream of taking her to Rwanda to meet the little girl I have been sponsoring for almost ten years. Other than that, how have you been since Blogtoberfest? I signed up! Thanks for hosting that and also for all the kind words. She did such a fantastic job with the video! I loved the part about no special meals for picky eaters! This post captures everything I think the holidays should be about! Thanks for warming my heart tonight! This is just so wonderful. Thank you for sharing your story. So inspiring! Your card design turned out great! This is such a beautiful post. I was so inspired by your daughter's video and your card. Thank you for sharing this with me today. What a life changing experience for so many people. How very wonderful of your family and you to take up such a project! Homes, schools, health clinics - it must be so fulfilling! That's a beautiful card! Jessica, this is a truly stunning Christmas card design which totally captures the true meaning of goodwill to men and peace on earth more. 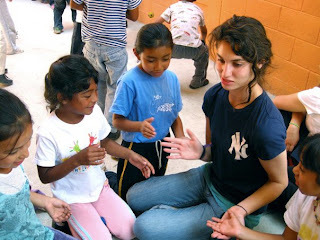 What a kind and generous soul you are and how wonderful to have made such close friends through your volunteer work. Your card is beautiful and I envy your experience in Guatemala. I had an ESL student from Guatemala and I was stunned by the amount of physical labor he did, every day, seven days a week but he made time to learn English. What a wonderful experience for you and your family. The card is smashing!!! I love the little children all around the globe, holding hands in friendship. If only adults could get along as well. What a worthy project, Jessica! Blessings on you for doing this. What an inspiring and uplifting post, Jessica!! Your holiday card design is spectacular! A most inspiring post Jessica! The card is just great and I love the title of your book. Your daughter is so lucky to be going through such wonderful experiences so early in life. This is lovely in so many ways! Happy PPF! What a beautiful card Jessica, and what a truly wonderful way to combine your passion of art with giving. You're such an inspiration.Happy PPF! I love your card! You and your family are great souls! Happy PPF! Your holiday card is beautiful, and touching! This is a fabulous post and you are a fabulous person. Happy PPF. so fab to see your heartwarming post! 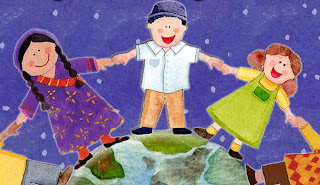 I love the kids hold the world happy and savely in her hands! Touching and inspiring! Thanks for the beautiful post. Happy PPF! Colourful, sweet & fun card. Your are doing such a great work with those families! Beautiful card, I love their happy little faces! One person truly can make a big difference in the world...and MANY can change it. Thank you, and blessings and prayers for all. 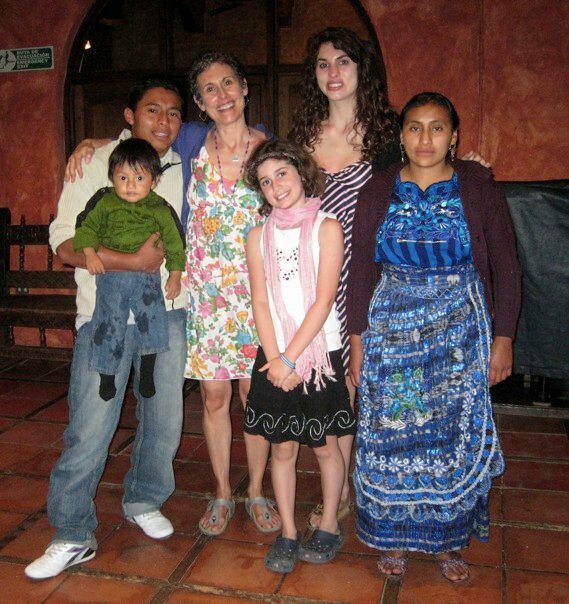 Oh Jessica what a wonderful work you do there with your family! And such a great idea to write a book about it, it must be an amazing experience for your daughter! The card you designed is beautiful. Represents to me the true meaning of Christmas. Lovely post, you are an inspiration! Lovely card, too! Beautiful post and I love your Christmas card design. What a great post. That video is amazing. Your daughter is so lucky to grow up with a mom like you. FHTH sounds like a wonderful organization! how generous of you to donate your beautful card and a book! i agree with wednesday, your daughter is very blessed to have a mom like you! jessica, how superb that you could be part of something so important! that art design is wonderful. :) i like the video too. samy did an excellent job. i nearly cried. it makes me appreciate, and be grateful for what i have. Beautiful and uplifting.... I loved that the children are all holding hands and have big smiles on their faces.